Uncategorized – getting started? getting going! Here are four writers whom I met through Danielle Gordon, a writer and member of Hook a Sister Up (HASU). Founder – Principal Shannon Cohen, Inc.
Do you have a book you’d like to write and believe I can assist? Contact me at this link GETTING STARTED? GETTING GOING! It It would be my pleasure to meet with you and set up a coaching schedule that will help you meet your goals to become a published author, too. Or join me for a beginning writers workshop at the upcoming HASU Women Who Write Showcase, in October at the KROC Center in Grand Rapids, Mi. “My mentoring relationship with Ms. Anna has been invaluable and instrumental in my journey in getting my book completed. Sharon released her book DOING THE WORK: Women Overcoming Real Khaos in August, 2017. Writing a picture book is more than creating a story. One must know the audience and purpose to be able to choose the appropriate story line, vocabulary and illustrations. ” Working with Anna has been an awesome experience. Although I am a writer and provide services for others, I can be my own worst critic when it comes to my own projects; due to this I had turned the focus off of my own projects and pushed them to the side to instead put my focus on helping others bring their work to fruition…that was until I met Anna! 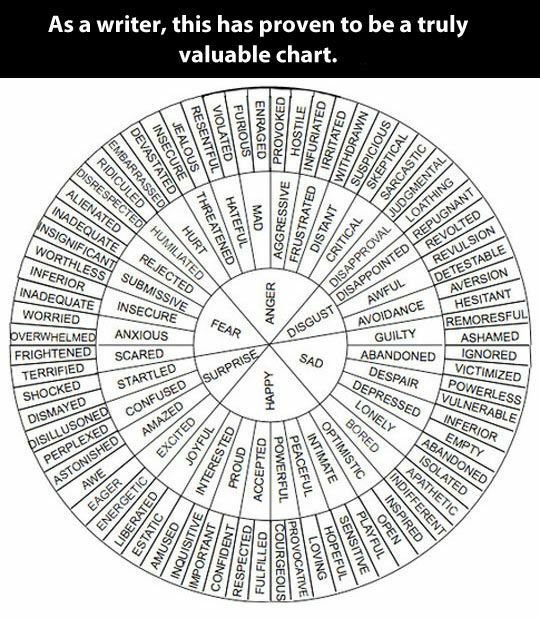 Here’s a diagram that may help expand your options for writing about feelings. Using vivid verbs, concrete nouns and more specific adjectives help your readers see what you want to portray with your words. Below that is chart with more words to evoke images of specific colors. I am on step ___________________________________________. My next step will be to (step in writing process)______________. Contact me here to set up time for a coaching session. Both new and experienced writers sometimes experience writers’ block with a head or heart full of ideas but have a tough time getting those first words on paper. What often unlocks the log-jam is understanding or remembering that writing is a process. What you write first is not necessarily what is read first. So, get started with a splash down. This means begin writing whatever comes to mind. Once you have words on the page you can begin the revision process of expanding, exploring, and explaining the ideas, developing the story, reorganizing the thoughts into sections, paragraphs, sentences that best clarify your ideas and engage your readers enough for them to keep reading. It’s not necessary for the next steps to flow in any particular order, but all will need to be taken before your manuscript is ready for publication. KNOWING YOUR PURPOSE FOR WRITING will help you chose ideas to include in your manuscript. Consider those mentioned here. During revision stage, it’s critical to pay attention to TRAITS of EFFECTIVE WRITING, writing that achieves your purpose. Check here regularly for resources to assist you as your write. You'll find links and notices of upcoming events. Want help preparing your manuscript? Complete questionnaire . See link on CONTACTS page.